Your very LIFE during the next few years depends upon your willingness to CHANGE! You had better HEED the facts in this article. A FEW years from now - probably LESS than ten years - the WORLD TOMORROW broadcast will suddenly disappear from the air waves. Many of YOU will wonder why. 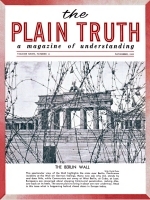 You will wonder because you have been hearing the broadcast and reading The PLAIN TRUTH magazine - but doing NOTHING about it! Perhaps - at that time - you will hear sarcastic reports that Mr. Armstrong and others with him went into "hiding" to await "the end of the world." Such reports will NOT be true!